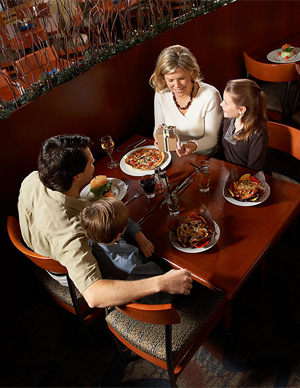 How to have a relaxing meal in a restaurant with the kids. By the time the middle of the week rolls around, the temptation to escape the house and take a break from cooking is almost overwhelming. Sitting across from your spouse with a cold glass of white wine in hand while waiters cater to your children’s whims is a lovely vision. Unfortunately, eating out with small children can be a stressful experience. I was living on the family-friendly Upper West Side of New York City when I became a parent. In a neighborhood where strollers get the right of way, it was easy to resume mine and my husband’s favorite activity: dining out. At first, our habits hardly changed. We simply needed a larger area to accommodate the car seat at the table. The louder the restaurant, the better the baby slept. When our baby became a toddler, we had to be more prepared. Still, eating out was manageable. Our toddler would entertain herself for a good hour with a bowl of peas and carrots. Things got more complicated as our family grew. But, now a family of five, our determination to keep eating out has never waned. While we occasionally cave in to the kids’ pleas to go to chain restaurants like Friendly’s or Boston Market, most of the time our family sticks to restaurants that offer food we’re all excited to eat. Be mindful that the early bird enjoys the meal. Get to the restaurant before your kids are hungry. They’ll work up an appetite as you wait for the food to come out. If you can get to the restaurant before the dinner rush, the waiters will be motivated to serve your food quickly, ensuring your family doesn’t tie up the table. Melissa Chapman, a contributing writer for Time Out NY Kids, often opts for the Early Bird special, not only for the discounts but also because she’s found that the elderly clientele is more likely to see her young children’s rambunctious behavior as cute. Read the host before the menu. A frosty reception is apt to lead to a tense meal. There’s no point in staying if you’re not wanted. Make your own children’s menus. Don’t be scared off by the absence of children’s menus. Most restaurants can make kid-appropriate fare like noodles with butter, white rice or sauteed chicken breasts. Many dining establishments even offer french fries and breaded chicken. Even if a restaurant has a children’s menu, I tend to ignore it and make up healthier plates like grilled chicken with steamed broccoli or breaded veal with sauteed carrots. Come prepared. Bring a tote bag with crayons and coloring pages to the restaurant, entertaining tools that most restaurants lack. Perhaps even have a few toys reserved just for restaurants. Include in the creative tote boxes of Animal Crackers and raisins in case the kitchen gets backed up. Jessica Rosenberg, author of the blog It’s My Life, brings a wide array of snacks, like pretzels, carrots, cheese and raisins, along with crayons and Play-Doh to keep her two toddlers amused. Take your sweet tooth on the road. Consider a different locale for dessert. Our family often heads to a casual location for dessert, rather than staying in a restaurant for a long period of time. After paying our check, we get a breath of fresh air as we walk to a nearby ice cream parlor for sundaes or to a diner for rice pudding studded with golden raisins and a sprinkle of cinnamon. Host a family game night out. Sitting around the table while waiting for the waiter to bring the food offers an ideal opportunity to play games together. Stacy Libby, a California mom, loves to play the “move game” with her 4½-year-old daughter. Libby invites her tot to close her eyes and then removes a few items from the table, moving other items around. This game keeps the child occupied while developing her memory and observation skills. These tips are definitely not foolproof. My family has certainly had a fair share of complete disasters, involving crying, having food fights, running in the aisles, a child hiding under the table and spilling water. Every family has off nights. But we continue dining out week after week, and we’re often rewarded by meals full of good food, laughter and love.